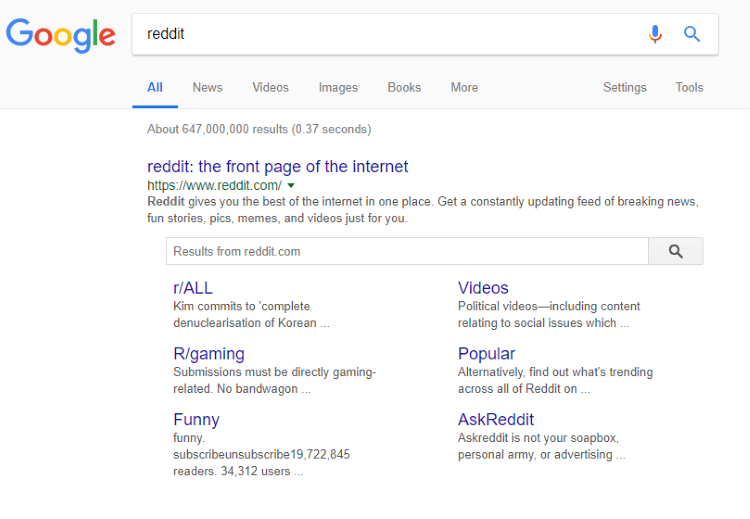 As of today, June 14th, 2018, Reddit is the third-most popular site on the Internet in the United States according to Alexa rankings. Reddit boasts 1.69 billion users from April 2017 to May 2018. The website ranks third behind the likes of Google and YouTube and ahead of a few websites you may have heard of including Facebook, Amazon, and Wikipedia. Even more staggering is the actual statistical data of Reddit site sessions. On average, users spend 14 minutes and 59 seconds per day on the site (1st among the top ten sites) compared to 2nd place Facebook which comes in at 10 minutes and 37 seconds. 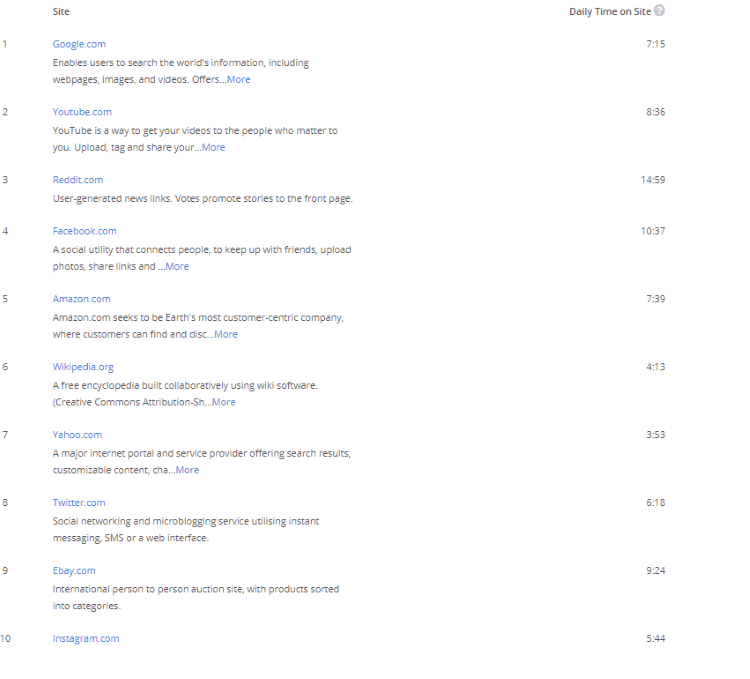 Reddit visitors also register 9.66 daily page views per visitor, which is also 1st among all of the top ten websites. This amount is double that of Facebook’s 4.01 daily page views per visitor. As advertisers and marketers, we are always looking for the best places to get our product and message in front of consumers. So, based on the numbers above, why aren’t more companies spending time either advertising on Reddit or interacting with Reddit’s website visitors? According to Reddit’s advertising website, their advertising allows companies to target their audience, tell their story, and measure their success, much like other social media platforms like Facebook or Instagram. But very rarely is Reddit ever considered an option for digital marketers. Based on the numbers above, one would think that Reddit would be at, or near, the top of every marketer’s list. Well, if that quote about Reddit’s community is not what marketers are looking for, then what exactly are they looking for? One of the surefire reasons Reddit does not appear often in digital marketing proposals is because there is a lack of understanding of how Reddit works by marketers. But the question remains, should Reddit be in the same conversation as Facebook Ads and Google AdWords when determining where to spend our advertising dollars? Over the last few weeks our team has spent time taking a deep dive into the Reddit platform and creating this article. We take a look at what Reddit is and how it works, how to go through the ad creation process, whether or not Reddit should be considered as an advertising platform, or if Reddit might be better suited as a social media platform for your business. Feel free to use the links above to jump to the specific section of this post. At the core of the Reddit website are what are known as subreddits. Subreddits, or sub-communities, are created by users that are interested in a certain topic in which users can participate in a thread like discussion. Registered members are able to submit content to the subreddit and other members of the community either up vote or down vote the content based on whether the content is relevant, useful, funny, or a complete lack thereof in regards to the topic. Think of the subreddit as a rolling list of contributing thoughts or media to a specific subject with the most popular items at the top as voted by the contributing followers of the subreddit. When looking at Reddit from a marketer’s perspective we can see that Reddit is an aggregation of topics that people are interested in and talking about. For a marketer, this is like shooting fish in a barrel when it comes to displaying relevant content to a specific audience. This conclusion only furthered our interest in setting up a Reddit advertising campaign. In order to advertise on Reddit you need to create a login for your business on their advertising platform. This platform can be found at https://ads.reddit.com. 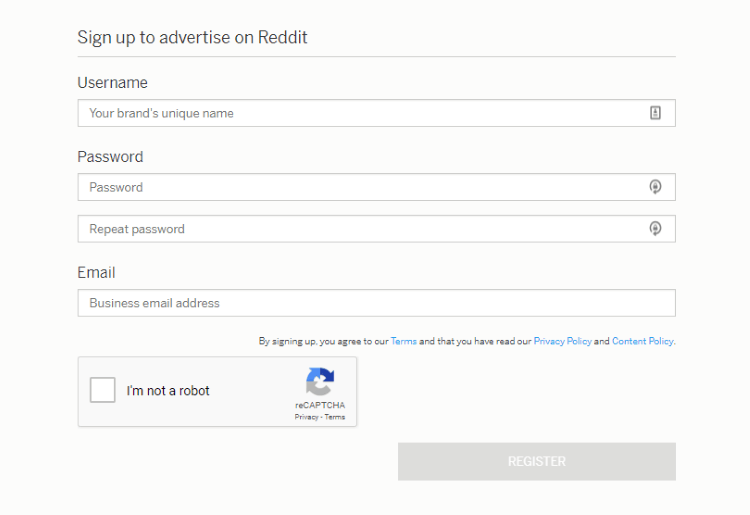 Reddit will ask you to register and include a username, password, and a business email address. Once this information is completed you will then come to a dashboard that has very similar language to that of a Google AdWords campaign. On the left-hand side of the screen you will see your campaign name and objective along with ad groups and ads. Reddit has made it an emphasis to simplify its dashboard and ad sign-up process much like Google has done with the their AdWords Express platform that bridges the gap between corporate and local marketers. Once you enter your campaign name you can then select the campaign objective. Again, we will see very similar campaign objectives that Google AdWords offers including increasing your ‘Brand Awareness and Reach’, ‘Traffic’, or ‘Conversions’. Select your goal and then move on to the ad portion of the setup. 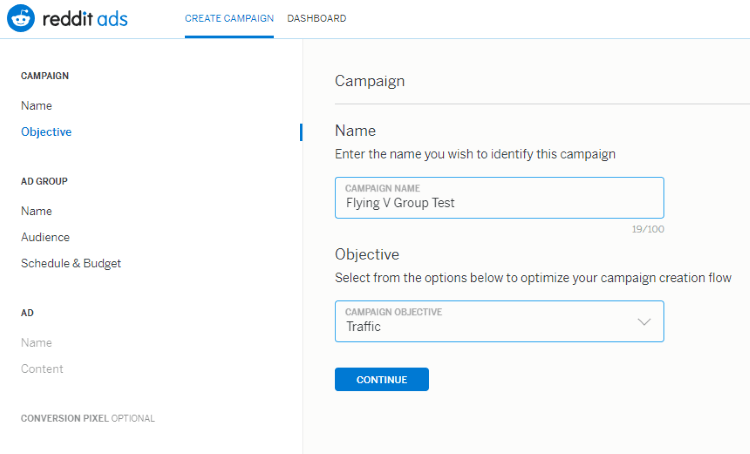 For this example, we named our campaign ‘Flying V Group Test’ and chose ‘Traffic’ for our campaign objective. Specific locations were not available for our specific ad group. Specifically zip codes were missing. This is not to say that locations will not be available for you, but we had to select all of California for our example vs. a specific city like Anaheim, CA, which was not available. A predetermined list is supplied for advertisers to use when selecting the interests their ad will be based on. This could be a deterrent if your ad group does not fit this list. Device based targeting included desktop and mobile, but it did not determine what viewports or resolutions. While your site should be optimized for mobile anyways, it is sometimes hard to determine how pages are performing without specific indicators on viewports and resolutions that the engagement is coming from. With all of that being said, the above configurations calculated to a total of ~1M Daily Impressions on the Reddit website. The ad traffic on Reddit is generally cheap since you are paying a maximum set bid for every 1,000 impressions of your ad (CPM). Even more appealing is that Reddit users are known as being extremely influential. Should you create the perfect ad that is worthy of their time, attention, and interaction your ad spend's ROI could be even more impressive. Your maximum bid is the price you are willing to pay for the top position of the subreddit. Make sure that you are providing a quality ad that offers benefits for the users of the subreddit. It would be wise to invest time into researching subreddits just like you would research keywords. Doing so will allow you to select the perfect threads for your advertisement to be displayed on. When creating our ad we will be asked to provide the specific information that will be displayed on the subreddit. Advertisers are required to enter the ‘Ad Name’, ‘Post Type’ (Link or Text), ‘Headline’, ‘Post URL’, ‘Display URL’, ‘Card Image’, and ‘Thumbnail Image’. Reddit gives us a preview of the ad and allows us to determine whether or not we want to allow comments on the post. Reddit ads should be conversational and we also suggest allowing comments to increase the opportunity for engagement on your ad. Once all of this is complete we will submit the ad to Reddit and it will go under review. Make sure that your billing information is complete and your email is confirmed otherwise there could be a delay. You have now just created your first ad campaign. Is Reddit Worthy of Advertising Consideration? Short answer, of course. Look at the numbers. For a longer explanation, keep reading. While Reddit has amazing opportunities for engagement and awareness, the biggest drawback is the lack of flexibility and granularity that the dashboard and ad creation process offers. The Reddit dashboard and setup is similar to AdWords Express. This could be seen as both a negative or a positive, but for those that love to have control of all aspects of their campaigns it could easily be seen as a negative. Also, while multiple subreddits are available to advertise on, there is no variation of subreddit targeting or even specific demographic targeting. Advertisers are strictly locked into the group or groups of subreddits that they choose to place their ads on and they must be sure that this group includes their customer. 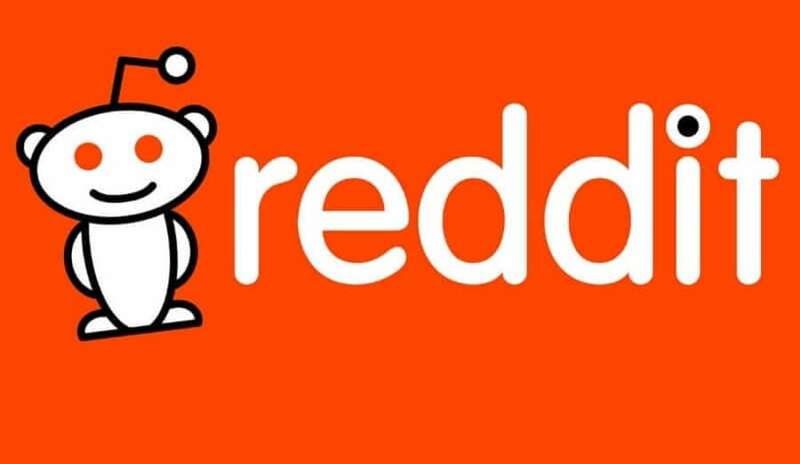 However, for businesses that are looking for a simple, yet powerful advertising opportunity that provides tons of potential relevant and active traffic to their site, Reddit could be an awesome platform. The ability to pinpoint a target audience based off of specific subreddits (currently 1,209,738 subreddits as of 1-10-18) is extremely helpful when advertising. Reddit's effectiveness as an advertising platform will be determined by a company's ability to understand and know who their target demographic is and what they want. We consider Reddit to be a very worthy opportunity for advertising your business assuming the fit is a good one. For example, if your advertising goals require a specific location for interaction or purchase, Reddit might not be the best platform for you to use versus a location-based ad campaign like Google AdWords. Should I Use Reddit as a Business Social Media Platform? If Reddit advertising is not right for your business, the social network might still be useful for your social media efforts. We all know how important social media is to business success. Reddit could be used as a platform in your social media strategy for business growth. AMAs are also known as ‘Ask Me Anythings’. If your brand has a unique following or provides an extremely specialized function, hosting an AMA might be worthwhile. You can blast out the AMA to your email list and interact with your customers or potential customers while talking about your product or providing valuable information for them to use. As mentioned earlier, people found on Reddit are often times some of the most influential and persuasive of online users. Getting involved with subreddits that either directly relate to your business or even indirectly relate could be beneficial for you to gain valuable insight into industry trends and what people are talking about. It would be wise to interact with users in the same way that businesses interact on question forums like Quora. Once again, the information being posted on subreddits is criticized using the Upvote/Downvote. If you are actively involved in the discussion, or following along with the conversation, you may find opportunities to either provide your own content or link to other content to show that you are a valuable contributor to the network. People may even begin to consider you an expert on any given topic. Just be sure to not be self-promoting to the point of moving the conversation off-topic. If you feel like something you have created truly provides value then, by all means, share it with the community. In conclusion, Reddit is an impressive network with tons of valuable information and active users. It is up to individual businesses alongside their marketing teams to determine whether the platform is right for them from an advertising standpoint, but we believe Reddit could be useful for all businesses in some way. The numbers speak for themselves and Reddit is an untapped market of billions of engaged, influential, and interesting customers. I’d hate to be the one left on the sideline. If you found this article helpful please share it with your network. Or, even better, subscribe to our company’s newsletter. The newsletter is sent once monthly and is filled with all of the latest developments in the digital marketing space and tips to help you enhance your online presence. 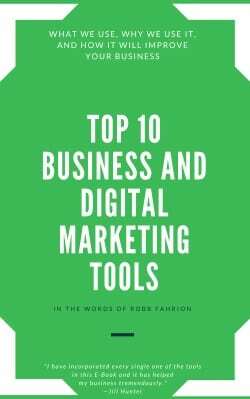 You will also receive a free E-Book that includes the Top 10 Business and Digital Marketing Tools that we use to run Flying V Group.